A little over two months ago, two days before Christmas, our family made the necessary decision to have one of our two older dogs, just diagnosed with inoperable cancer, euthanized at home. The vet came on a blustery Friday evening after his clinic appointments were done; my husband and son had worked in the cold wind preparing the grave on a little hill overlooking the barnyard. This peaceful but unmarked spot has become a pet cemetery over the years, now with three dogs and at least that many cats lying under the apple trees. It was difficult for our family that night to think of our dog’s still warm body tucked into that cold ground. That bare patch of dirt has stared at me as I’ve passed by over the last few weeks and our other dog has paused there once or twice, as if knowing where his old friend lies, and where someday he will be. Then over the last few days, though we are still in the midst of wintry weather, with passing storms of hale, frozen rain and snow showers, I was astonished to see that plot of bare ground transforming. 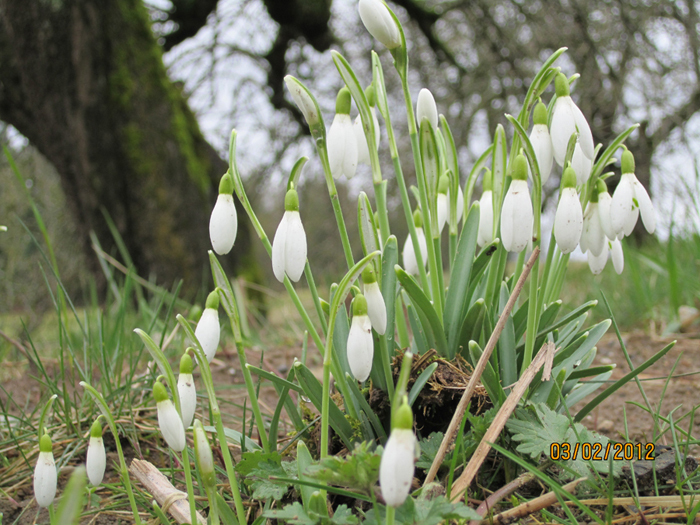 Snowdrop flowers had appeared from nowhere. They had not been there before and I have no idea where they would have come from. Possibly disturbing the ground brought previously hidden bulbs closer to the surface. No matter how they found their way there, they are a breath of relief and promise after a dark winter. 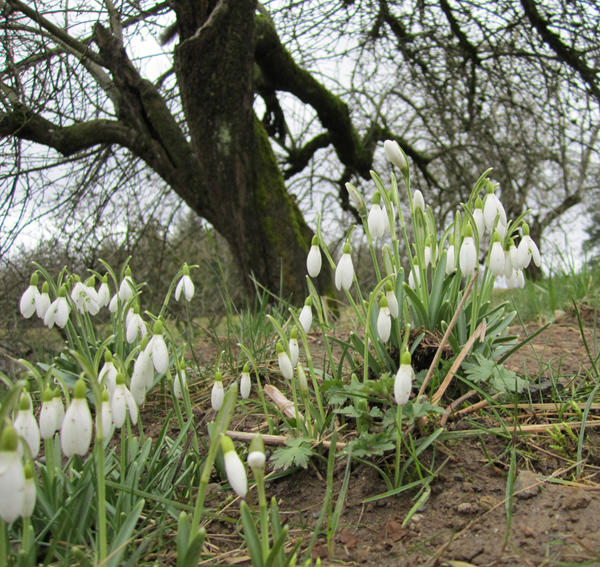 They are bright and clean and pure in the midst of otherwise unadorned mud, embraced overhead by stark bare orchard branches, their little white bells stirred by winter breezes. They are brave and insistent that life goes on, in reality thriving over the top of death. So we are encouraged to follow in His steps, one slow difficult step at a time. The going is painful much of the time, strewn as life can be with thorns and tears. Yet, because He walked there first, going ahead of us, His footprints through the thorns are filling with flowers, cushioning our path with unsurpassed love and beauty. Thanks for sharing the blessings and mysteries of His presence. Those were probably deeply buried bulbs, but that makes it no less a miracle and a sign of new life. After the painful decision to have our old dog euthanized I was (via sunglasses) pensively watching clouds drift by and saw within each of two clouds a rainbow. That may happen all the time but I’d not noticed it before. For me it was a sign of promise and new life, perhaps real life beginning.